Green Depot (GD): Could you elaborate a bit upon your companies, and their missions and visions? Eldon Scott (ES): Urban Space was founded in London by Eric Reynolds in the 1970’s and quickly became well known as creators of Camden Lock Market which became the 3rd busiest attraction in London and a center for music during the Punk Rock days and an incubator for an earlier generation of entrepreneurial, cultural and environmentally savvy start-ups. Now we are seeing a second renaissance in environmental and social entrepreneurship and we see it as our business to provide infrastructure support in the form of marketplace destinations. 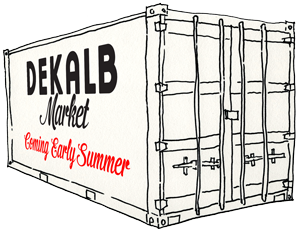 The mission we distilled for Dekalb Market has been carefully considered [around four key concepts:] entrepreneurship, sustainability, community, and quality. Our goal (and ultimate success) is to find entrepreneurs who have a product which both fits the overall mission of sustainability, is of inherent quality, and is accessible (in terms of price and presentation) to our customers. Thomas Kosbau (TK): I founded ORE Design and Technology Group in 2009. The name ORE is partly an homage to my roots in Portland Oregon, but also embodies our approach to finding and synthesizing the raw potential of new technologies and systems found in the natural world into design solutions. Our projects range from bio-reactors to tea sets, from a desalinization system integrated into a skyscraper to a passively cooled Lower East-Side community garden. ORE’s designs are award winning. In 2010, ORE took first place in IIDA Awards competition out of 4,000 entrants with a proposal to replace Incheon, Korea’s infrastructure of conventional asphalt roads with organically grown sandstone streets. ORE also won first place in RIBA’s International Energy Revolution competition, with a design enabling five residential blocks to be powered by bio-engineered algae panels. Also in development is a bio-mimetic cactus that harvests drinking water from the air in arid environments. ORE continues to seek challenging projects and provide innovative design solutions. GD: Tell me a little bit about yourselves, your positions and responsibilities within the company, and how you got involved? TK: I’m still a young designer in the field of architecture and industrial design, but in the past 8 years I’ve been able to do all scales of projects from office towers to a jacket/shelter for homeless people made from discarded umbrellas I collected after a heavy New York rain. I was born and raised in Portland, Oregon and as the son of the founder of the Portland Parks Community Garden Program was exposed to organic urban agriculture from the beginning. I started my education in chemistry and physics before moving to architecture. At the University of Stuttgart in Germany I was first exposed to bio-mimicry in architecture at the ILEK institute under Architect/Engineer Werner Sobek. I’ve taken this model into my private practice, pulling from my roots in science and sustainability as ORE’s Director of Design and Technology. GD: How did the idea for the container project begin to develop? Where’d you get the idea? ES: Urban Space has been building with containers in London since the 90’s with the inception of Container City. Containers were a natural step for us in Brooklyn. We are also working with Lotek and partner Young Woo on a larger container project for Pier 57 in Manhattan [PDF]. TK: Using Containers was all Eldon’s idea – he’s had considerable experience with the medium of modular design with post-industrial processes through UrbanSpace in London. GD: So would you say that sustainability has been a core focus of the project from the beginning? TK: Absolutely – The first move, of course, was adapting used and “one-time” shipping containers into our vendor and event spaces. From the beginning we’ve set out to use as many sustainable/ salvaged building materials as possible, which has been made possible by our collaboration with GD. ES: Yes, the four criteria [including sustainability] inform all our projects. Small businesses are the front line of the local movement in production and the cultural reaction against globalization and wasting of resources (much as “Small is Beautiful” was the seminal book during Camden’s heyday in the late 70’s). We utilize the approach of “Smaller, Quicker, Cheaper” to build lightly on the ground with less raw resources. Most of the materials are salvaged including the containers which form the main structure, the tented covering, and wood and steel from Build it Green. We are trying as far as possible to create a self-sustaining ecosystem with reduce reliance on outside inputs. Electricity is being supplied by Green Mountain Energy from renewable sources and we are working on site-based wind and solar. We are not hooked-up to the City Sewers and all rainwater is sloped to a collection point where is can be used to water plants. The vegetable, chicken and bee farm help us to compost food waste, create soil, and pollinate edible plants which in turn are used by chefs on-site. Most important, the site is economically sustainable. We do not rely on government grants, only on the transactions generated in the marketplace. GD: There have obviously been great successes with your other projects – do you forsee any new challenges with this one? ES: No, we don’t envision any major issues. TK: Honestly, the most challenging part of this project has been determining how to treat temporary buildings that will stay on-site for up to ten years with the building authorities. We ended up treating our containers as permanent buildings for our permitting, but have designed the project to be movable (complete with a self-contained plumbing system) once our lease has expired. GD: Could you detail how Urban Spaces and GD are going to be working together? ES: Yes – we are looking to procure building materials and supplies from Green Depot. [All of our] new materials we are sourcing from Green Depot. TK: Green Depot is providing us and all of our vendors with a great discount on green building materials. For green building materials, like eco insulation, as well as many other green products for a sustainable lifestyle, visit http://www.greendepot.com. The founder of Green Depot, Sarah Beatty, was recently interviewed by Living Shelter Design architects, who run a podcast and radio interviews. Sarah Beatty founded Green Depot in 2005 with a mission: to make green living, green products, and building solutions accessible affordable and gratifying. Since then, Green Depot has supplied hundreds of projects, including Harvard University, the New School, Albany Public Libraries, the city of Chicago, and the Capitol Building in Washington. Green Depot educates the building trade and consumers about “what green means” every day–via their proprietary CLEAR filter, FLIP It Green service, community programs and events. Earth Day New York and the NRDC awarded Sarah their 2009 Business Leader of the Year Award. She is a member of the Women’s Business Enterprise National Council, LEED AP, and has a B.A. from Harvard College. Click here to read more from Sarah’s bio. Graham Hill is the founder of TreeHugger, a prominent sustainability website dedicated to environmental inspiration. Recently, Graham launched the LifeEdited project, an open-source contest to help him redesign his small apartment to be as comfortable, and environmentally-friendly, as possible. Green Depot has partnered with Life Edited, and we were fortunate to get to speak with him about it. Green Depot: So, we know that you’re the founder of TreeHugger.com. Could you tell us a little bit about how you got involved with that project? Graham Hill: Well, I’m an entrepreneur. I had done a bunch of work with the internet, and opened up an internet shop in Seattle in the 90s so I had a lot of experience with that. I’m passionate about being green, and I saw that something was missing on the internet. I wanted to building something to inspire, by hope, instead of by, you know, fear. Solutions weren’t being aggregated into one place on the internet. GD: That’s really great. Could you tell me, then, a little bit about how you got the idea for LifeEdited? GH: I guess I knew a bunch of key statistics, so my sense of things [about living space] was pretty much based on those statistics, and it made me want to rethink some things. You know, homes in the 1950s were on average 1,000 square feet, and now they’re 2,300 square feet. At the same time, family size has gotten smaller, so we have so much more space. But somehow in that time, shopping also became a hobby, and we had all of this space, but we still had this new need for a new industry – the storage industry – to keep all of our stuff. The new storage industry is 22 billion dollars large. At the same time, happiness levels have remained about the same, and our environmental footprint has really ballooned, and we’re saving less and borrowing more. So this was a new equation for me to explore. Personally, I’m happy with a few bags, when I’m traveling or living abroad. I’m happy with the space in have in, like, a hotel room or wherever. Larger spaces didn’t make me happier. And you probably know that in New York City 80% of our environmental footprint comes from buildings, and there are so many simple technologies and idea to apply to our buildings to lower our footprint. I’m interested in creating compelling, small places, and lowering my costs to make me happier. GD: So, just to clarify, are you buying a new place to apply the ideas from the contest, or are you just renovating your current apartment? GH: Yeah, I bought two places – one is 350 square feet on the 6th floor, the other is 420 square feet on the 2nd floor. I’m living in the 350 square feet one in the interim while we retrofit the 420 one, and then after that’s done we’ll renovate the 350 square feet and I’ll probably try that one out for a little bit, too. GD: The project is really democratic, or open-source – anyone can submit a design. Has the response to the contest been good so far? GH: Yeah, I’m very happy with it. We’ve gotten a fair amount of press. But more important than that, you know, is that we’ve gotten around 35 submissions already, and we still have two months to go. GD: Are you finding that most of the entries are being done by designers and architects, or are you getting responses from amateurs as well? GH: Well, we’re totally open for everyone. Anyone can submit. But we’re getting some very talented 3D modellers so my guess is a lot of them are designers and professionals. GD: And you’re working with Green Depot now on the contest? GH: Yeah. Green Depot is a sponsor, and when we’re ready to begin building it we’re going to be getting some of our stuff from Green Depot. GD: How soon are you going to begin work on the project? GH: Well, the contest is over January 10, so it’ll be the Spring before we even begin anything. GD: Are you finding the submissions to be really innovative? What are some of your favorites? GH: There are so many! Really incredible – stuff coming out of the floor, out of the ceiling; rotating walls, folding chairs that go flat that you can hang on the wall. I’d really suggest just having a look around at the website. GD: Is there anything else about the project that you’d like to mention? GH: Yeah, two things. One, the success of the project really relies on the submissions. We have really great people submitting and it’s a great opportunity for designers – there’s a $70,000 award, tons of media, so people need to submit and get the word out about the project. Also, you can sign onto the site and comment. The idea about open-source design is not about the final deadline, but about the jury and the crowd to offer suggestions to evolve the design, and to talk about the positive and negative aspects to make them as great as they can be. I had the opportunity to speak with Ori Sivan, the founder and general manager of Greenmaker Industries. Green Depot carries a range of products made by Greenmaker, including the well-reviewed Ivy Coatings VOC-free paint, our Plybam bamboo plywood, and Foundations bamboo flooring. Green Depot: Mr. Sivan, I was just wondering if you could tell me about your position at Greenmaker. Ori Sivan: I’m the general manager for Greenmaker Industries. GD: And could you tell me a little more about what Greenmaker does? OS: Greenmaker industries is a green building materials manufacturer, so we have several lines of green materials from commercial cleaning products to bamboo floors and bamboo plywood. We really provide a one-stop shop for green dealers, and any sort of reseller, who wants to carry green products. People choose to go through us to get those products because we provide them with a range of products that are all environmentally-friendly and priced really well. They’re very high quality products with very competitive pricing. GD: It sounds like you have a strong emphasis on quality and affordability in green products. OS: Well, one, I came from a retail background before I got into wholesale business, so we really have a good idea of what the customer needs. Let me say that the most important thing that we do is that we search far and wide for the best products and provide them at what we feel is a very competitive price. In the case of our bamboo flooring – Foundations – you’re getting an extremely good product that is as good as any conventional flooring, but is sustainably produced. We make things affordable by keeping our overhead low. We don’t invest in advertising. Instead we invest in our dealers. We trust Green Depot to pass on the message that this is a good product and talk about the different installations that they’ve seen done. In other words, we count on our dealer base for the end user to get a quality product with a good end-value. GD: Which products would you say are the best received by the customer? OS: Well, definitely, the two most popular products are Foundations Flooring, and then Ivy Paints. GD: We’ve actually spoken to Kevin Stasi before about the benefits of Ivy Coatings. Could you tell me about some of the benefits of using bamboo flooring and plywood over conventional wood products? OS: When comparing bamboo to conventional wood, the two things that are outstanding are one, from an environmental aspect they are extremely renewable. Bamboo takes five to seven years to grow, and when you cut it down, more bamboo grows back in its place, like grass. This is so much more renewable compared to another wood, which would typically be a hardwood like oak or maple. It’s also much much more sustainable than a tropical hardwood. Tropical hardwoods and bamboo are both dimensionally stable, so they don’t expand and contract. Tropical hardwood and bamboo are hard, so they don’t bend. But topical hardwoods take up to 300 years to mature – compared to bamboo’s six years – so bamboo is much more sustainable. It’s also a very beautiful, appealing product in a variety of different shades. We apply a number of different stains to create beautiful bamboo products. We also provide a product that can be custom stained for designers and architects. GD: Could you tell me a bit about the cleaners that Greenmaker Industries produces? OS: A lot of the cleaners we make are Green Seal and Design for the Environment certified. They’re extremely cost-effective because they’re extremely effective at cleaning. We’re now seeing a lot more interest in green cleaning not only in homes, but in commercial settings – universities, hotels, restaurants, businesses. We are being approached by the commercial sector to provide this. GD: So the focus was on home cleaning before but there’s been a recent growth in commercial interest? GD: You mentioned that the cleaners are Green Seal or Design for the Environment certified. What does it take to get that certification? OS: It’s an involved process. We basically had to open the formula to the reviewer to check for toxins and other things like that. It was a lot of paperwork and money, but if you’re doing a product right – making it environmentally-sensitive – from the beginning there’s not a lot of trouble to get it done, just time and effort to get all of the documentation in order. When you’re doing things right, and start with the right materials, it’s not that hard to. But it still can take several months – three to six months. GD: Thanks so much for taking the time out today to talk with us! Greenmaker offers a wide range of products, each of which has a website. Check out www.foundationsflooring.com, www.ivycoatings.com, www.greenmakercleaners.com, or www.plybam.com for more information. You can see which green products that Green Depot carries by visiting our website. We recently had the good fortune to speak to Curtis McKinney, Team Leader for the Chicago Greencorps. Each year Greencorps hires roughly 70 people into its nine-month green industry training program, with a special emphasis on weatherizing homes for low-income people and senior citizens at no cost to the homeowner. Thanks to the efforts of Curtis and Joe Silver, the manager of our Chicago location, Greencorps and Green Depot have a strong working relationship. Green Depot: Hi, Curtis! Great to talk with you today. I was wondering if we could start off by having you tell us a little bit about Greencorps – how long has the program been around, and how long have you been working with Greencorps? Curtis McKinney: Well, I’ve been working with Greencorps since 1996, so I’m going on fifteen years. The program itself was started in 1995. It’s a training program. We’re a job training program that started off by training people in things like remediation, weatherization, tree care training, and other things like that. We also try to teach some life skills. GD: Do you mostly work with volunteers? CM: No, we’re mostly a hired staff. Greencorps is a program through the City of Chicago, and the Department of the Environment. We also work with the Safer Foundation [a re-entry program for ex-offenders] – they do a lot as one of our training partners. Safer handles a lot of the social services that we provide. We’re also partners with WRD Environmental which helps us with funding and management. Lately we’ve been classified as a reentry training program, so that’s how they like to characterize our program. GD: Could you tell me about your work with the weatherization program? CM: What we do is we work with low-income homes and senior citizens, and we renovate their homes. First, we do an energy audit of the home. From there, we go in and we try to fill as many air holes and leaks as we can find. We do caulking, windows, doors, window plastic if we need to, and blow-in insulation in attics. The weatherization stuff we do is low-cost weatherization. The most expensive thing we do is the blow-in insulation, which is not really that difficult to do. GD: As far as insulation goes, do you mostly focus on attics or do you do walls, as well? CM: Yes, for insulation we just do attics, and all the material we use is environmentally-sensitive. We used recycled newspaper insulation, that’s been ground up really fine. We use low-VOC caulking and the toxins and smell from that is very low compared to conventional caulk. We also use blue jean insulation to plug some of the larger holes – that insulation is made from recycled blue jeans. GD: Are there any other parts of the home you focus on, specifically? CM: Well, we also feel around doorways and doorways. We try to close off fireplaces – to make sure the flues actually close. This year, we’re installing what’s sort of like a balloon to fill the chimney. We reach up inside the fireplace, and blow the balloon up, and it totally blocks air from coming inside. GD: And you guys get your green products all from Green Depot? CM: Yes, we probably get 90% of our material from green depot for the program. Everything from thermostats to blue jean and recycled paper insulation, the caulking, window film, door strips, foam weather stripping, hot water tank covers, chimney buckles, we pretty much get everything – actually, it may be more like 95%. GD: And you’ve been working with Joe Silver, of the Chicago Green Depot location for a while? CM: Yeah, absolutely. We’ve been working with Joe for three to four years, maybe longer. At first they Joe was supplying the city for the weatherization fair and made the home weatherization kits that we’d hand out to citizens. Back then, someone from downtown was sending out kits to people to do themselves, but then we changed it and started to install them ourselves. That was where the weatherization part of Greencorps came form – the City. We still make home weatherization kits; that’s another one of the programs we do through the Department of Environment. We make the kits for them, and they distribute them through the school system, where they train the teachers on how to use a lot of the materials in the kits, and then the teachers give them out to the community so they can weatherize their own homes. We get the materials for those kits from Green Depot. GD: This all sounds great! Thanks so much for speaking with us. Anything else you’d like to share about the program? CM: You know, it’s just a really good program that the city has going. So far we’re in our 4th year of doing weatherization in people’s homes and it’s something that’s going to continue into the future, and that’s a good thing. When Mayor Daley looks at what we’re doing, he sees good things. The program really is a success for the city. You can find out more about the Chicago Green Corps and the weatherization program by visiting their website, here. The building at 222 Bowery, in Manhattan, was built by the YMCA in 1885 to be its Young Men’s Institute. But over the decades on the way to its current LEED Platinum status as the headquarters and flagship retail store of Green Depot, it has been everything from a Buddhist meditation center to the home of William S. Burroughs–and most recently, a restaurant furniture supplier. Architects Colin Brice and Caleb Mulvena of Mapos, LLC saw value and beauty in the building’s past lives, and sought to preserve elements of them for its current incarnation. In the process, they not only created a unique and dynamic environment for the company’s operations and sales, but managed to preserve and recycle resources (and help us continue preserving them) like the green design champs they’re known to be. To coincide with an article in the current issue of GreenSource magazine about their work on the project, we took a moment to speak with them about their involvement in green building and what they’re excited about for the future. Green Depot: Were you guys involved in green architecture and design before you got the Green Depot commission? Colin Brice: Yes, we were. We didn’t and still don’t really market ourselves as “green architects” per se, but sustainability has always been a big part of what we do and how we work—it’s who we are. In terms of marketing, we focus more on the attention we pay to how we work to understand our clients’ values and design with them in mind—the green part is in the second paragraph, if you will. But it’s always been a fundamental part of our design process. GD: Do you guys follow what’s going on in the green building movement in general, or do you pretty much stick to your own inspiration? CB: We definitely keep up what else is going on. We take classes, go to lectures, participate in forums, even teach classes and give lectures ourselves sometimes. We try to play a really active role in the green building community. GD: What are you most excited about, as architects, with regards to green building? Is there a kind of green building product or philosophy that you see really catching on among your clients and other architects? CB: I’d say what we’re most excited about is the growing awareness among building owners that green building and design are things that they can do; that they can afford. And one of the things we find really interesting is the growing understanding among business owners that going green is about more than just building materials and green products—that their business practices and maintenance habits are just as important, if not more so, than their construction techniques. For example, it only does so much good to use all-green building materials if you have your air conditioning cranked all the way up with the windows open all the time. Things like that are only just starting to become part of the general consciousness, but they definitely are becoming so—and it’s nice to see. Even the LEED criteria are being updated all the time to reflect more of that way of thinking, and it’s great. Another thing we’re excited about is that the more fundamental principles of green building, which start before the materials are even considered, are becoming understood by the general public—like the importance of repurposing existing buildings instead of building new ones, choosing the best orientation for the majority of the windows, and making the best use of prevailing breezes. Something like 75% of green design, in terms of energy conservation, can be handled at that level if you start there—and considering those things doesn’t even necessarily involve any more expense than not considering them. Then choosing energy-efficient materials and power and ventilation systems make up only the other 25%. GD: Are you working on any green projects at the moment that you’re really excited about? CB: We actually have two—one is a residence in upstate New York that is probably the greenest project we’ve ever done. The owners aren’t applying for LEED certification, but they’d certainly get it if they did—they’re going all out, starting with things as basic as the orientation of the house, like I was just talking about. But on top of that they’re installing geothermal heating and cooling, radiant-heat flooring, sun shading for the massive windows, and lot of recycled materials. It’s really an amazing project, incorporating a lot of passive house principles. Then we’re also working on a new office for a big internet company, and recycling is playing a huge role in the design process for that project. The previous tenant left everything—all the cubicles, chairs, lighting—and we’re taking it apart to reassemble it as new furnishings and new lighting. We’re actually calling the part of the project that’s usually called demolition “disassembly” instead, for there are very few dumpsters involved. And a fun part of that project is that we’ve developed a new working process to help keep the employees involved in the design process. As a company, they place a huge emphasis on their identity as a community and preserving their sense of that. As architects, we feel it’s important to be able to tap into a community’s values and create environments that support its goals. So we’ve been meeting with this client throughout the process and have come up with games they can play to help them figure out what they as a group want for their office, and they’re really enjoying it. GD: Thanks for taking the time to talk with us, Colin. We look forward to seeing some of your future work!